« How Darwinian and atheistic were the Nazis? More amusingly, the book was a candidate in the 2007 Diagram Prize, which is awarded each year by the readers of the UK booktrade magazine The Bookseller to the book with the oddest title. Sometimes, oddness is in the eye of the beholder (one competitor, Baboon Metaphysics, sits happily on my bookshelves and is a cracking read). Mainly however, they are indeed pretty weird, such as Tattooed Mountain Women and Spoon Boxes of Daghestan, Crocheting Adventures with Hyperbolic Planes or How to Avoid Huge Ships, all of which won the coveted title. The sound of creaking leather from their collective greatcoats broke the silence as the assembled Wehrmacht officers leaned forward to examine the huge table map of the Spreewald, the vast forest area standing between the XI SS Panzer Corps and the Red Army. The problem was clear – vast stretches of gorse in the forest (Ulex europeus) were in flower and it was the nesting season of the rare inversely-spotted bark-spitter. The other officers grunted in assent. There were those amongst them who could still recall the terrible Battle of the Somme in 1916 – how entire woods were destroyed, how the crash of the shells broke the noise abatement regulations as far away as Camden and how the noxious exhaust from the infernal English tanks caught the back of the men’s throats. No, that was the carbon footprint to end all carbon footprints. Never again! This entry was written by whyevolutionistrue and posted on November 17, 2011 at 7:42 am and filed under Uncategorized. Bookmark the permalink. Follow any comments here with the RSS feed for this post. Both comments and trackbacks are currently closed. Don’t laugh – the Germans made great use of bicycles as did other armies! There is of course a Wikipedia entry! Talking of weird titles, there is Women, Fire and Dangerous Things by UC Berkeley linguist George Lakoff. The title refers to the intricate noun classification system of a Polynesian ((if I remember correctly), in which there is a special category containing exactly the three entities listed in the title. Adolf Hitler could dance the pants off Winston Churchill! 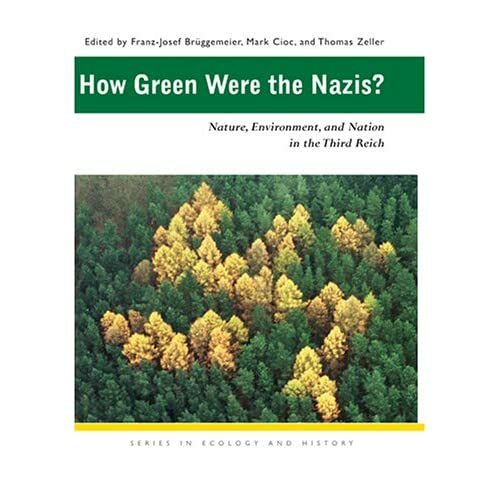 When I first glanced at the title, I thought it was “How Green Was My Nazi”. I’m a regular follower of your blog and appreciate and admire what you do here. I should add that this book was one we published when I was director of the Ohio University Press. It’s a serious book, and the title was meant to be provocative. I think it worked! –The cover photo was not doctored. It’s a photo of a mature growth of an intentional planting of deciduous conifers (larches) among the evergreens. The cover photo is amazing. At first I assumed it was doctored, then I thought maybe it was real, then I decided I couldn’t tell! Just read the actual synopsis – fascinating. It fits nicely with the PR scenario they were trying to sell, of creating a utopia, and dovetails with Goering’s woodland estate, Hitler’s mountain retreat, and film clips I’ve seen of Goebbels’ family basking in the country sunshine. But I suppose it was also a goal that was used to support the whole Lebensraum business from the start. The spoof intro is brilliant, too. While not wishing to make light of the topic, somehow lebensraum sounds strange translated into English. If they wanted a larger living room they should have bought a bigger house. Hitler’s “Reichsnaturschutzgesetz” (Nature Protection Law) of 1935 remained German and Austrian legislation until 1976. The “Reichstierschutzgesetz” (Animal Protection Law) of 1933 remained the legal basis until it was replaced by a Federal law in 1972. Again, the story is a complex one. The twisted interaction between conservationism and reactionary politics goes way back to the Romantic movement of the late 18th century. Brown, the Nazi colour, was also chosen (among many practical considerations) because it was an “Earth” colour. The pedigree of ideas is not always palatable. Even the Nazis weren’t wrong about everything, they weren’t actually Satan after all. I spent some time getting from field site to field site in a small open boat on the Panama Canal, and the title of this book would not have seemed funny at all to me back then. Robert Proctor has pointed out how Nazi scientists were way ahead of others in terms of recognizing the health consequences of tobacco and smoking, the benefits of a good diet, and other public health measures that are now considered common sense. Of course, they did some bad things, too. Those tended to overshadow such progress rather badly. But, Jonah Goldberg still compared environemtalists and public health advocates to Nazis. And, unfortunately, he and his gutter-hugging fellow-travellers will be only too happy to seize on books such as this to further their sliming of environmentalists. Some adherents of that movement, and of its encompassing Zeitgeist, were anti-modernist nationalists, occultists, even downright quacks. Many later adhered to National Socialism. Maximilian Bircher-Benner, the Swiss muesli pioneer, became in old age a sympathiser of Nazi ideas, and was offered a chair at the Rudolf-Hess-Hospital in Dresden. His disciple, Werner Kollath, known for his own muesli mixture and an ardent promoter of “Vollwertkost” (Whole Food), became a leading Nazi physician, nutritionist, hygienist, and adept of “the elimination of inferior people from reproduction”. Hitler was a vegetarian. His reasons were not health nor that a vegetarian diet allows one to feed more people, but rather moral ones. Not quite true either, according to documentary evidence; if anything, his reasons were ideological. Hitler developed his cuckoo theories about food as about anything else. According to sources from his entourage, he blamed meat-eating and cooking on the contingencies of the Ice Age. His acquired distaste for meat appears to have been genuine, although his portrayal by propaganda as a vegetarian ascete was probably blown up out of proportion. His adoption of various eccentric “Whole Food” diets, much of his own making and ideologically rationalised, was prompted by persistent digestive problems, such as cramps and flatulence. Aversion against cruelty towards animals is often quoted as a reason for his vegetarianism. It has been widely publicised by propaganda; I know of no credible direct source reporting this as the principal or essential reason for his veggyness. Just wait. In a year or so, Ben Stein will no doubt see this and proudly narrate a “documentary” describing how conservationism makes you a Nazi. Hey, don’t dis Crocheting Adventures with Hyperbolic Planes . Though I did not read the entire book, I did read a excerpt in a magazine article, and ended up crocheting my own hyperbolic, which I then gave as a holiday gift to my son’s partner (an engineer with a love of math).